The exhibition Novi Sad from the 18th to the 20th century provides a unique opportunity to visitors of the City Museum of Novi Sad to learn about the artefacts of fine and applied art from Department of Cultural History. The exhibits come from rich collections of Novi Sad and the family legacies over the past decades, and display the development of the city from the 18th to the mid-20th century and, thus, illustrate the lifestyle and culture of living of Novi Sad. 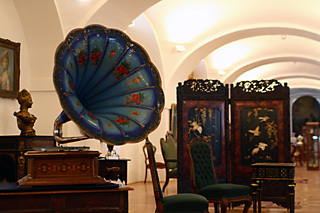 Although the Department of Cultural History has very rich collections of fine and applied art, the collection of old photographs and archival materials, garment and decorative textiles, books, magazines and musical material, as well as many personal items of Novi Sad citizens, in this display is exposed mainly large material, arranged in the form of ambiental and style content units. In chronological order are exposed paintings, sculptures, furniture, clocks, mirrors, chandeliers and lamps, rugs, objects of metal, porcelain, glass, musical instruments and a few items from the Department of Ethnology, characteristic for the ethnic communities from the city surroundings. Novi Sad obtained its freedom in the mid-18th century and, since then, its development was reflected in the strengthening of the bourgeois class which had enough resources and opportunities to live in the way people lived in Central Europe. That development can be exactly seen on the exhibition, which starts with a unit related to the 18th century. 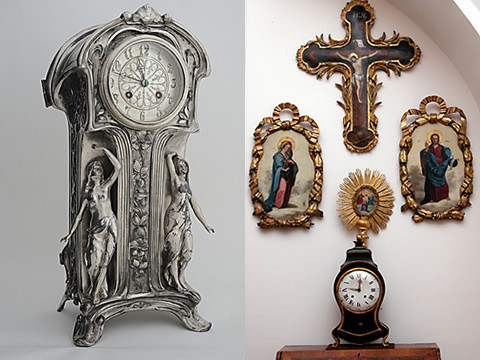 This period is illustrated by icons and religious objects made by the most important artists from Novi Sad and Vojvodina, then by objects made of wrought iron originating from the Fortress and its baroque suburb, as well as by pieces of furniture that are works of German masters. 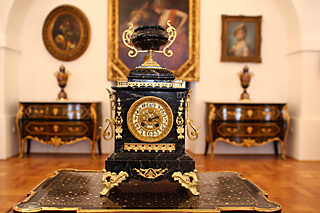 Stylistically purest unit is represented by three segments in which the exhibited items and furniture are from the Biedermeier period, which for was very typical for our region during the first half of the 19th century. The presented exhibits are gaining in importance because of the enormous loss of the City of Novi Sad in 1848, when were almost completely destroyed the mobile home inventories of houses of Novi Sad. Biedermeier pieces of furniture, luxury objects of applied art and paintings of different genres are works of Vojvodina and central European masters. The period of city restoration, increase in wealth and purchasing power of citizens of Novi Sad, best show segments with ambience units characteristic for the second half of the 19th century. Newly acquired need for luxury is reflected in the magnificent pieces of furniture, mirrors and various pottery. 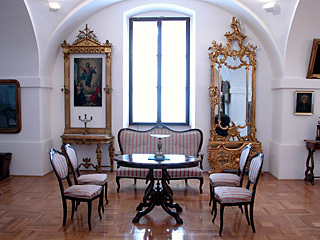 Furniture in the style of historicism, particularly new Rococo and Altdeuch, was especially popular in the ambient of Vojvodina, and was purchased both in national and international centers. Significant part of the exhibition is dedicated to those people who donated to the Museum, and therefore to Novi Sad, a large number of items, almost the entire mobile inventory of their homes. Family heritage of prof. Desanka Kostić, Danica Lučić, Radojka Vučetić and others reflect the diversity of content of civic collections in the first half of the 20th century. One of the greatest exposed legacies is the one that famous opera singer Melanija Bugarinović donated to Novi Sad. All the mentioned units are supplemented by paintings and sculptures from the Fine Arts collection of the Museum. They are mostly Serbian painters who lived or frequently stayed in Novi Sad. They were in the 18th century: Georgije Stojanović, Vasa Ostojić, Dimitrije Bačević, Teodor Dimitrijević Kračun, Stefan Gavrilović and others. They are followed by our great painters of the first half of the 19th century (Nikola Aleksić, Jovan Klajić, Petar Čortanović), and then the masters of the second half of the century (Steva Todorović, Uroš Predić). A rich collection of Serbian painting of the first half of the 20th century is presented by some of the best artists: Sava Šumanović, Mladen Josić, Milivoj Nikolajević, Mihajlo Petrov, Milenko Šerban, Vasa Eškićević, Bogdan Šuput, Sava Ipić and many other painters and sculptors. There is also very interesting group of paintings with motifs of Novi Sad, in some cases it is about long-missing vedute of the city.